By now, you may feel like you’re getting the hang of YOPmail’s disposable email addresses. Chances are you’ve picked an address that you like (or maybe even multiple addresses! ), and depending on your internet habits, you could be checking it on a daily basis. 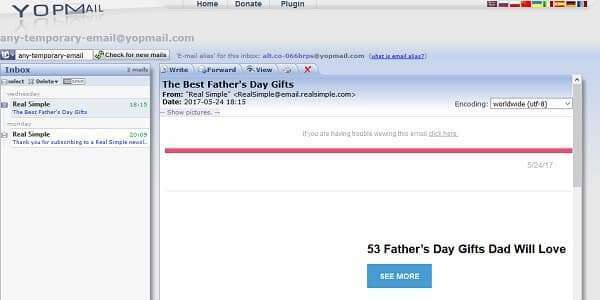 Once you get to this point, there is a cool feature from YOPmail that will help you do this more efficiently: the YOPmail plugin/browser extension. 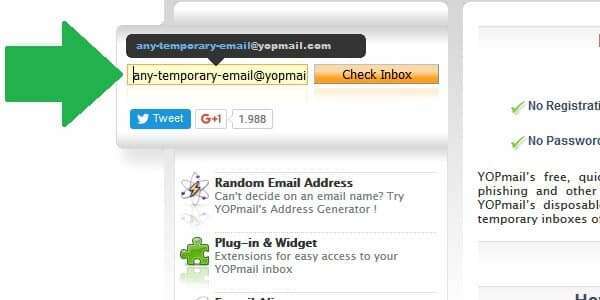 The YOPmail plugin is easy to install and use, and comes in very handy if you want to check your temporary email accounts on a regular basis. It is especially useful for people with multiple “favorite” accounts (i.e. 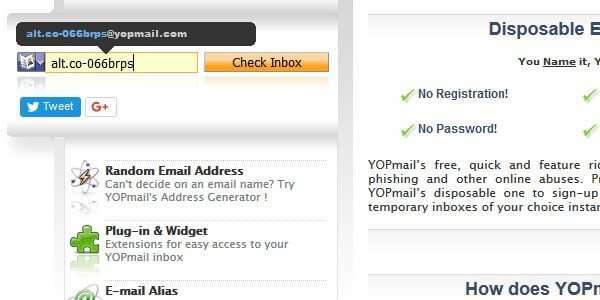 @yopmail.com addresses they habitually use). 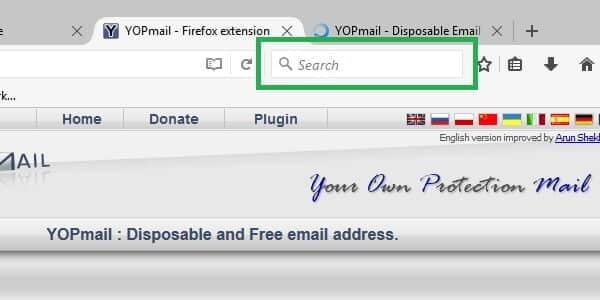 In this tutorial, we’ll go over what the YOPmail browser plugin does, how to install it and how to use it to check your disposable email accounts faster than ever. 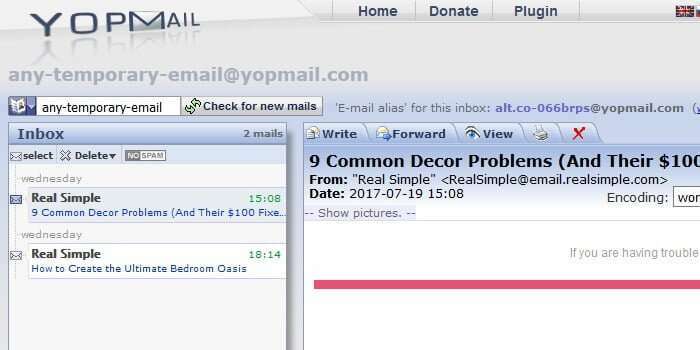 What is the YOPmail browser extension for? Here’s the basic idea behind the plugin. 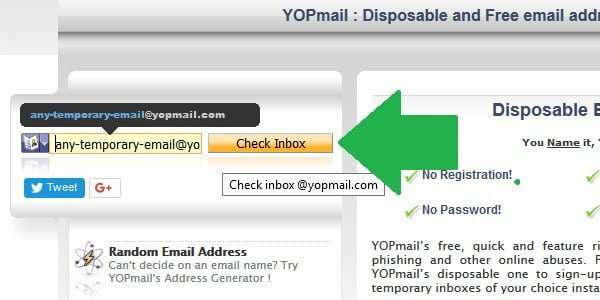 If you use YOPmail often, you have to go to the website, enter your email address of choice, and click the “Check Inbox” button every single time you want to check or use the account. Then, if you use multiple accounts, you have to go back to the home page and repeat the process to get into every account. It’s a bit inefficient, considering that YOPmail email accounts aren’t password-protected so you don’t even technically have a login procedure to go through. But if you look on the yopmail.com homepage, in the left sidebar, there is an option called “Plug-in & Widget”. 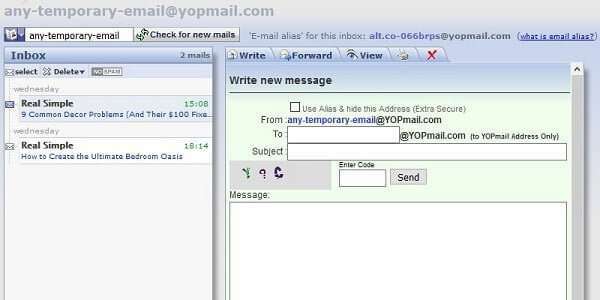 The description given is “Extensions for easy access to your YOPmail inbox”. You can click on this link to get more information and the download link. Don’t worry; we’ll go through all that later, step by step. 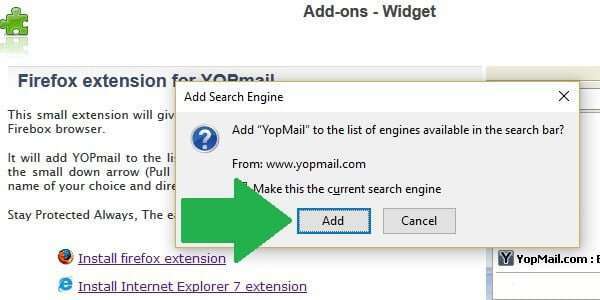 Once you install the YOPmail plugin in your browser (Firefox or Internet Explorer), it will be added as a search engine option in your browser’s tool bar. 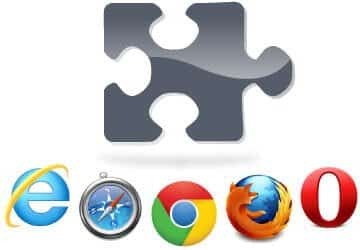 This lets you type in your temporary email addresses and go directly to their inboxes no matter what website you are on, because it’s embedded in your toolbar. I use Firefox, so the rest of this tutorial will show images that might be specific to that browser. But if you use IE, the overall process is similar enough that this is still worth reading. In my case, I will click on the link that says “Install firefox extension”. This isn’t technically a file to install, so you might be surprised when you don’t get a popup asking if you would like to save the file. Instead, you will see a window asking if you want to add YOPMail to the list of search engines in your browsers toolbar. Click the “Add” button (or “OK” or “Accept”, as the case may be). Note: if you don’t see this window pop up right away, try turning off any ad-blocker or popup-blocker programs you have running in your browser. I had to disable ad-block and click a couple of times before I got it to do anything. After you click “Add”, it might not look like anything has changed. If you look up here in the search box of my toolbar in Firefox, it looks the same as it did before. However, as soon as I open a new tab, the search box has been updated. It now includes a plus sign, indicating that there are multiple search engine options to choose from. In the future, this plus sign might not be visible, but if you move your cursor over the magnifying glass icon, a small arrow should appear, meaning that you can click it to open a dropdown menu of options. Now, let’s see this baby in action. 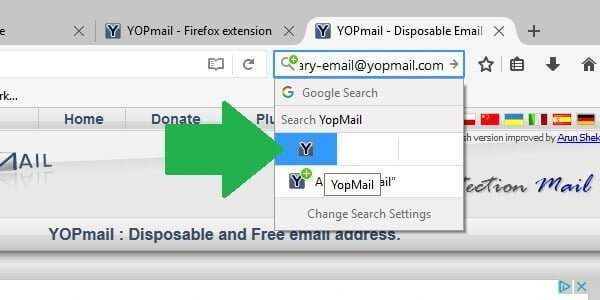 First, type your YOP disposable email address into the search box of your browser’s toolbar (next to the URL bar, usually). 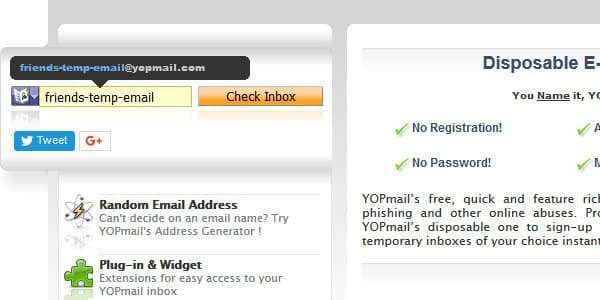 As usual, I’m using any-temporary-email@yopmail.com. Next, click to open the dropdown menu of search engines if your browser didn’t automatically do it for you. Click on the “Y” icon for YOPMail. 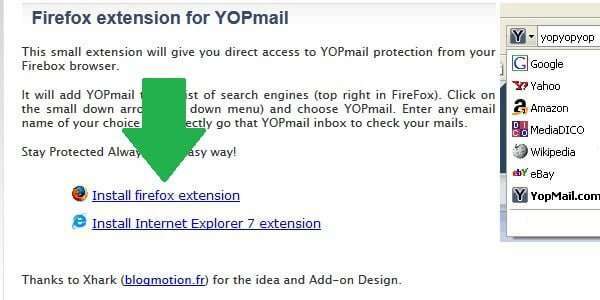 Effectively, what this tells Firefox to do is “search YOPMAIL for any-temporary-email@yopmail.com”. You’ll probably get a white screen with a URL that says something like “yopmail.com/en/?login=any-temporary-email…”. Depending on your connection speed, this screen may stick around for a few seconds while you are redirected. 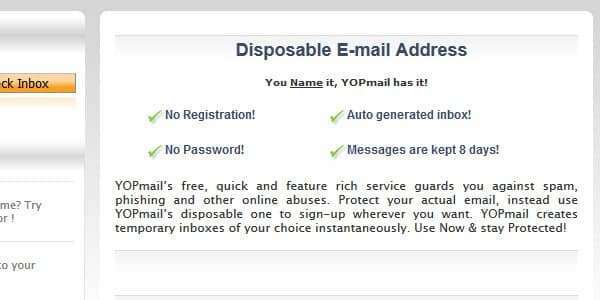 But if you just hold tight, soon you will be automatically taken directly to the inbox for the YOPmail disposable email address you entered. See? Quick, easy, and efficient! The real beauty comes if you have a second (or third, fourth, fifth…) YOP account you want to check. 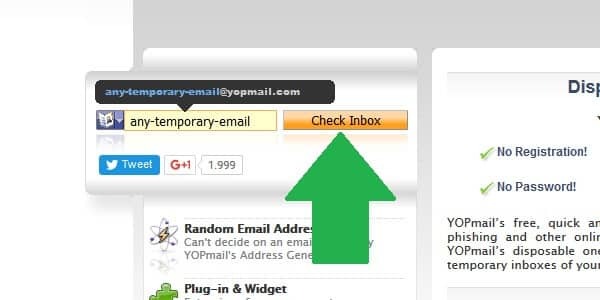 Because you have the YOPMail plugin, you don’t have to go back to the homepage, enter the next email, and click “Check Inbox” over and over again. Just type the next email in the search bar like you did the first time, and you’ll be taken there in just one click. Obviously, the YOPmail plugin isn’t an absolute necessity. It won’t do much for most users who only access their accounts casually. But for serious YOPmail users, the browser extension can really streamline the whole experience. It’s free and installs in just seconds, so why not give it a try? 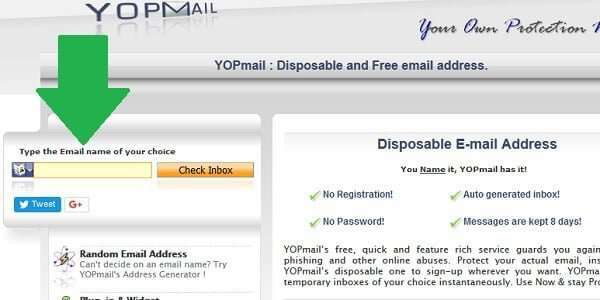 YOPMail is a great service if you need a temporary or disposable email address. Most people simply use these throwaway email accounts when they need to provide an email during some registration process, and they don’t want to use their real one because they are worried about getting a bunch of spam. One of the interesting things about YOPmail is that it doesn’t require any registration to use one of their disposable emails. Now, what this means is that any @yopmail.com address you choose is NOT password-protected. For many people who just want to use the service for random email newsletter signups, this isn’t an issue. But if you want some privacy, especially if you are emailing another person, then you might not like the idea of anyone with your email address being able to see what’s in your inbox. Instead of passwords, the way YOPmail provides privacy and security for their disposable email accounts is using alternate addresses, also called email aliases. They are very easy to use, but conceptually might seem a bit complicated. But don’t worry! In this YOPmail tutorial, we’ll go over how to use a YOPmail email alias to add security to your temporary account. 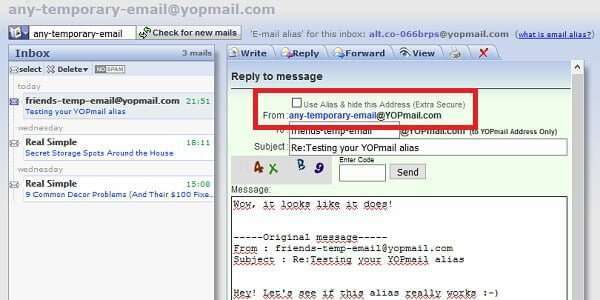 How do YOPmail email aliases work? 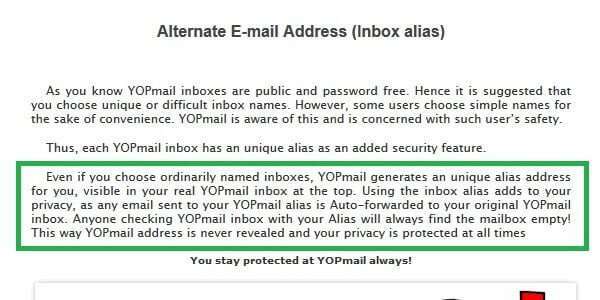 Basically, this is how your YOPmail email alias or alternate address works. As we have explained in previous tutorials, every @yopmail.com address has already been created and is free to be used by anyone, in theory. (This is why no registration or sign up is required.) Every address also has an “alt” version assigned to it, which is essentially just a forwarding address that allows you to keep the real YOPmail address private. You can find a basic explanation of what a YOPmail email alias is for and how it works right on the home page. From yopmail.com, in the main text, you can see that “you can also use your inbox’s email alias for extra security”. Likewise, if you look in the left sidebar, there is a section for “E-mail Alias” that explains how it works. You can click on the words “E-mail Alias” in this section to go to a page that explains the service in greater detail. What is my YOPmail email alias? As I said above, every YOPmail email address automatically comes with an alternate alias that can be used for privacy reasons. 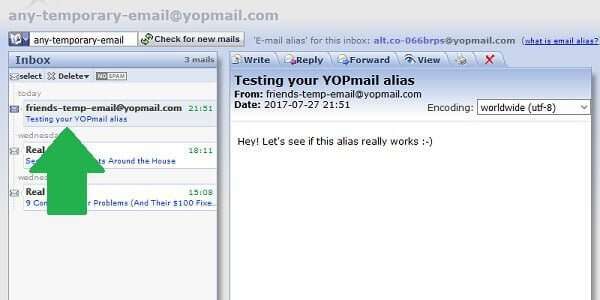 This alias is unique to its associated YOPmail account, and finding it is super easy. First, go to yopmail.com and “sign in” to the temporary email address of your choice. Like always, I’m going to use “any-temporary-email@yopmail.com”. (You don’t have to type the “@yopmail.com” part, by the way, but it’s okay if you do.) Then, click the “Check Inbox” button, just like you would to read your email. 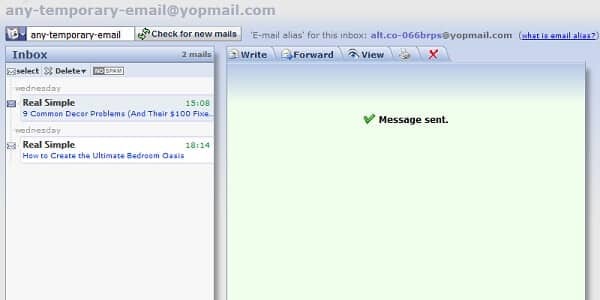 If this is not your first time using YOPmail or if you have read our other tutorials, you may have noticed this before. Up at the top of your inbox view, there is text that reads, “E-mail alias for this inbox: …”. The weird looking address that follows is the unique alternate email for the YOPmail address you are signed in with. Now that you know what your YOPmail email alias is, what do you do with it? The whole point of using the email alias is to keep your real YOPmail disposable address a secret from whomever you are corresponding with. This is usually more relevant for people who want to use their account to communicate with a real person. Here’s why a YOPmail alias is so important: Remember, none of the addresses on this platform are password-protected. This means that anyone who knows your YOPmail address can go in and check your inbox, just like you do. They could even, in theory, use that address to send messages pretending to be you! Not an ideal situation if you have anything of a personal nature in your email there. The solution to this problem is simple. Don’t give anyone your real YOPmail address! Only give them the alias that you located in the previous section. What this will do is allow their messages to be automatically forwarded to your real account, but since they won’t be able to see your actual YOPmail address, they can’t go snooping around in it. Let’s take a look at how this works with an example. For this example, we’ll say that I met someone in a hobby forum. We want a way to email each other, but we don’t know each other well enough to exchange our primary email accounts yet (Yahoo, Gmail, Hotmail, etc.). I suggest to them that we use YOP, and tell them they can contact me at “alt.co-066brps@yopmail.com”. Note that this is the email alias for my YOPmail address, NOT the real account. So, my new friend might go to yopmail.com and “sign in” to their chosen temporary email address, in this example, “friends-temp-email@yopmail.com”. My new friend would go to the “Write” tab to compose their email, and they would enter my YOPmail alias in the “To:” field, as you can see in the image below. They would then send the message like normal. Now, here comes the cool part. That alias address that my friend just emailed is programmed to automatically forward everything to my actual YOPmail account, “any-temporary-email”. So, the next time I “sign in” to my YOPmail disposable email address, my new friend’s message is waiting for me in my inbox. Note that I have signed into my regular YOP account just like always. You do NOT sign into your alias account to check mail, because it is forwarded automatically to your main account. 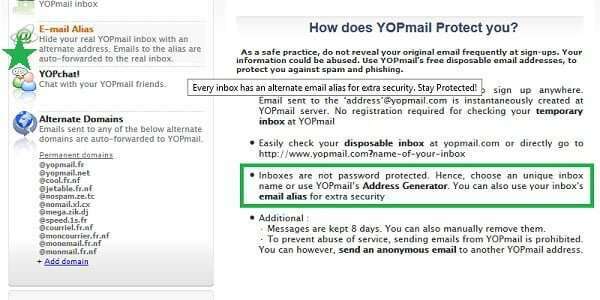 This section is extremely important if you are trying to keep your YOPmail disposable email private! The first time you go to reply to someone’s message in YOPmail, the platform will send the reply from your actual address by default, even if the message was originally sent to your YOPmail alias. If you leave this default setting, it completely defeats the purpose of using an email alias in the first place. Fortunately, changing it is very easy. In the “Reply” tab, the very first thing you’ll see is a checkbox for the option “Use Alias & hide this Address (Extra Secure)”. Make sure this box is CHECKED. If the box is not checked, you can see that your real YOPmail address is listed in the “From:” field. This means that my new friend could easily “sign in” to my account and see what I have in my inbox, who I’ve been talking to in the last 8 days, and even send mail to those people pretending to be me. But as you saw in that first image, when the box is checked, the address in the “From:” field is replaced with your YOPmail alias. This is what keeps your disposable email account private! You will also see that, when you check the “Alias” option, another option appears that says “Always Use Alias”. If you are worried about forgetting, it’s a good idea to check this option, too. You can always uncheck it later if you don’t want to use your alias for a particular email, for whatever reason. Now, I have finished writing the reply to my new friend’s message, made sure the “Alias” box was checked, and sent the email like usual. As you can see, my real YOPmail address is completely hidden; the only thing that appears is my email alias. Finally, let’s see how your YOPmail alias protects your privacy. Even if you don’t consider yourself very cynical, we all know that people on the internet are not always who they appear to be. If my new friend knows that YOPmail temporary email addresses are not password-protected, they might be tempted to go into mine and snoop around. If I had given them my real address, or neglected to check the “Alias” box when I replied, they would have been able to do just that. But since I gave them my YOPmail alias instead, here’s what happens when they try to stick their nose in my business. “No mail for alt.co-066brps@yopmail.com” it says. To protect your privacy, all YOPmail alias inboxes are always empty. The emails are forwarded to your main account, and not a trace of them is left in the alias account. If you look closely, you can see that the place where it usually lists the alias address for the YOPmail account is empty. This indicates that the inbox is for an alias address, since an alias can’t have its own alias. Better luck next time, nosy so-called friend! The last thing we’ll talk about in this YOPmail alternate address/alias tutorial is using alternate domains. I mentioned these domains briefly in our first tutorial when we used YOPmail to sign up for an email newsletter. They can also be used as a part of your YOPmail alias. You can read information about what YOPmail alternate domains are for and how they work from the yopmail.com home page, at the bottom of the left sidebar. You’ll see a list of domains that redirect to @yopmail.com automatically, so you can use them interchangeably. 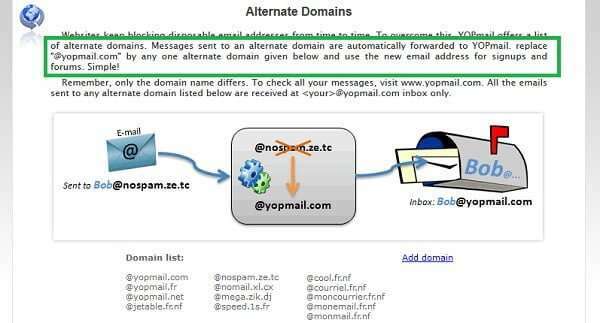 As you can see in their explanation, all you have to do is substitute any of the alternate domains they have listed where you would normally put “@yopmail.com”. That is all you have to do; nothing else changes. In the context of YOPmail email aliases, they don’t really do much. You have the same level of security or privacy regardless of which domain you use. Besides, since you can only send emails from YOPmail to other YOPmail accounts, it’s not like you’re fooling anyone. Whomever you are talking to has to be using YOP anyway, so giving them an alternate domain is kind of pointless. But if you want to use them, you can. The exception is if you are trying to use your YOPmail email alias to register on a website, like for a newsletter or to get a free gift. Sometimes, the registration platforms these websites use will reject email domains that they have discovered to be “disposable”. If this happens to you when you try to register with “your-unique-alias@yopmail.com”, you can try replacing yopmail.com with the alternative domains until you find one that it accepts. Whew! Like I said in the introduction, using a YOPmail email alias or alternate address is really easy to do. It is a sort of complicated concept to explain, but actually doing it is simple. Just check your preferred inbox for your unique alias address, and only give out that alias to people and websites. It’s literally just a forwarding address, but it is the way YOP is able to give users some privacy even though its accounts are not password-protected. 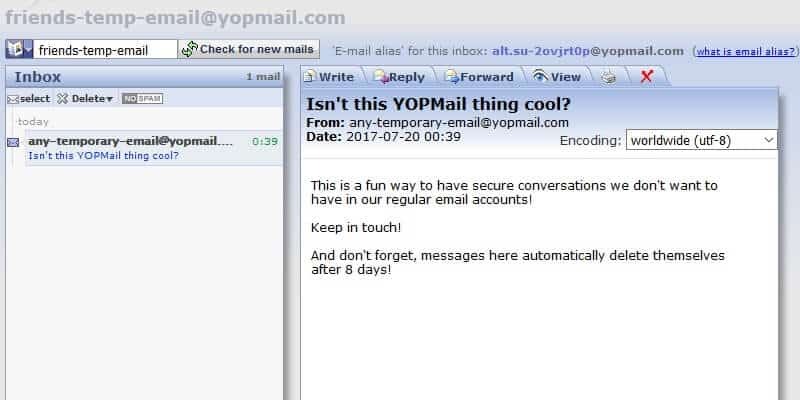 Are you enjoying YOPMail? 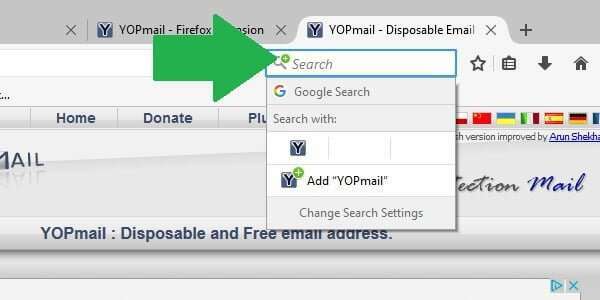 Make sure you check out our next tutorial about the YOPMail browser plug-in, for quick and easy access to your favorite throwaway email addresses! In our last tutorial, we went over how to “sign in” to YOPMail and check your inbox. I use quotation marks because there isn’t actually a true registration or login for YOP mail. You can find out what I mean by that in detail by going to the previous post, but you’ll probably be able to get the general idea from today’s tutorial, too. Today, we’re going to talk about how to send emails from a YOP mail disposable email address. 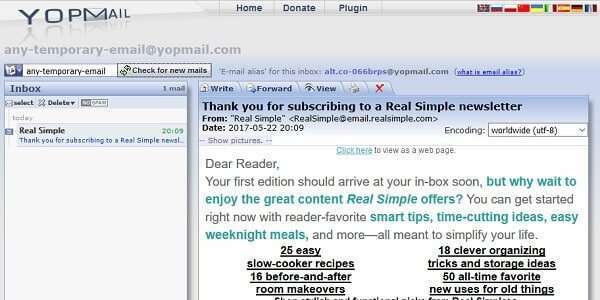 The most obvious way to use YOPMail is as a throwaway email address to use when you sign up on random websites that you don’t want to give your real email to. This protects you from spam, having your information sold to third parties, etc. Why send emails from a disposable email on YOPMail? However, YOP mail isn’t limited to that. Since it works more or less like any other email platform, you can also use it to send messages from an anonymous email account. 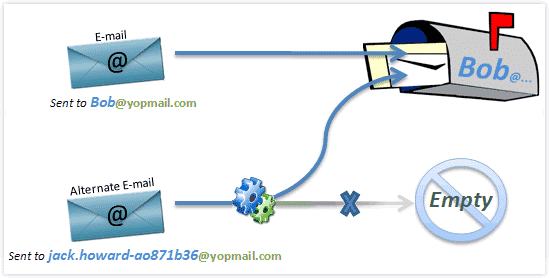 The catch is, you can only send to other @yopmail.com email addresses, so both the sender and recipient have to agree to use YOP mail ahead of time. There are many reasons why you might want to do this. For example, if you want to have a private email exchange that isn’t associated with your personal information via your primary email account, you can arrange to do this in YOP mail. Another example would be if you are still getting to know a person you met online, but aren’t ready to give them your real contact info just yet. As with most things, there will be as many reasons as there are people using the service. 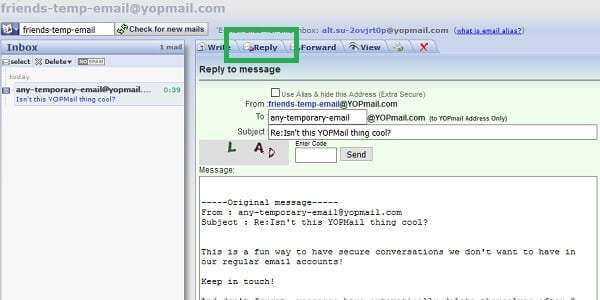 Now, let’s look at how to use a YOPMail disposable email address to send mail! Your first step is to “sign in” to the YOP email address you want to send the message from. As we have explained in previous tutorials, this can be literally anything you make up on the spot, and no registration is required in order to use it. But, if you plan to use it more than once, it’s a good idea to make it something you can remember easily. 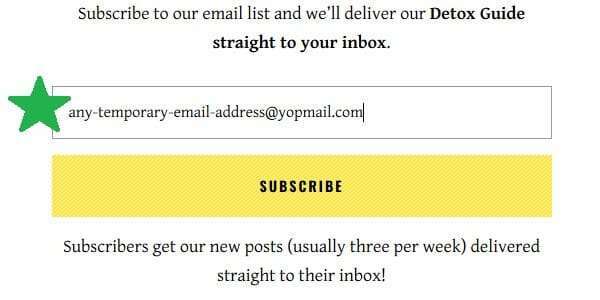 Go to the yopmail.com home page, and when you’ve decided on a temporary email address, just type it into the yellow box in the upper left corner of the page. In previous tutorials, I have used the address “any-temporary-email”, so I’m going to continue with that one today. 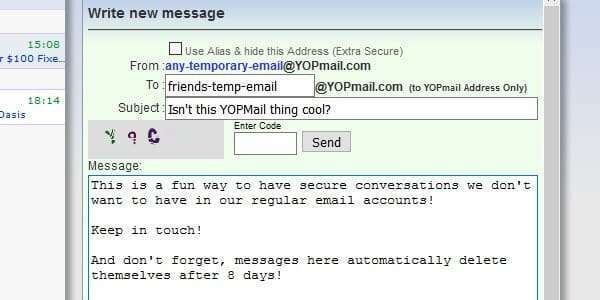 The only requirement is that it ends with “@yopmail.com”. Once you have it typed in, click the “Check Inbox” button. As you probably guessed, this will take you to the inbox for the email account you entered. Note that these accounts are not password-protected, so it’s a good idea not to use them for anything too sensitive or personal. You’ll see that I’m continuing to receive the email newsletter I signed up for in our first tutorial, which explains how YOPMail works in more detail. Now, to send an email using this disposable email address, simply go to the toolbar at the top of the inbox, and click on the “Write” tab. This will take you to a screen where you can compose the email you want to send, type in the recipient’s email address, subject line, etc. It’s very similar to any other email program you’ve used before. 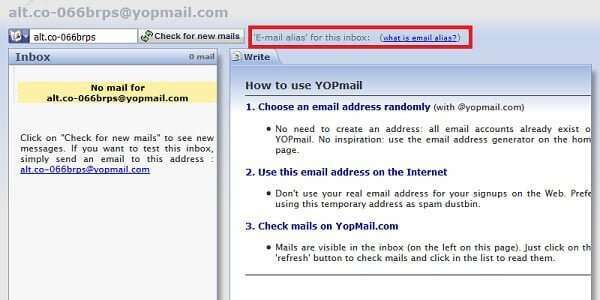 I mentioned this in the introduction, but it bears repeating: you can ONLY use YOPMail to send emails to other YOP email accounts. It says this next to the “To:” field, but it’s easy to overlook. As you can see, whatever you type into the “To:” field is set to automatically be an @yopmail.com address, and there’s no way to change this. Presumably, this is to prevent random people from using YOP’s temporary email addresses to spam or harass other people in their primary accounts with impunity. 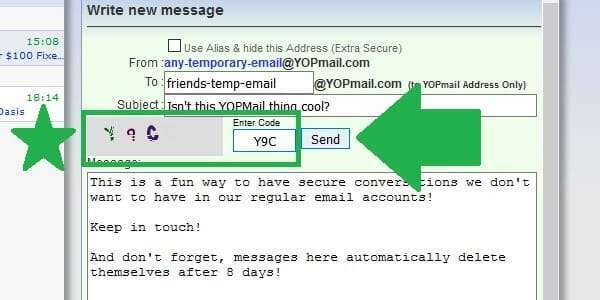 So, now all you have to do is type in the YOP mail address your friend or contact has decided to use, write a subject for the email, and compose your message. This part is pretty self-explanatory, and just like your regular email platform (Yahoo, Gmail, Hotmail, etc.). 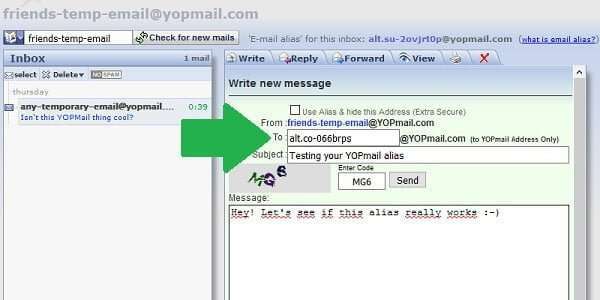 Finally, before you can send your message, there is one last step that makes sending emails in YOP mail a bit different. You need to enter a verification code, basically a very simple captcha code. The point of this is to prove that you’re human and not a bot that has been programmed to send tons of messages through the system. Basically, another measure used to prevent spam. Read the code, type the characters into the appropriate field just as you see them, and then you are ready to click the “Send” button. If the code was correct, your email will be sent and you should see a confirmation screen like the one below. The cool thing about YOP compared to other email platforms is that you can go to your friend’s YOP account and double check that the message you sent actually went through. Since none of the disposable email addresses here require registration and none of them have passwords, you can “sign in” to the other account just as easily as you did yours. To do this, just go back to the yopmail.com home page, and repeat the “sign in” process you used before. Only this time, enter your recipient’s YOPMail address instead of the one you used to send the email to them. Then, click the “Check Inbox” button, just like you did before. Just like in the previous section, you’ll be taken to the inbox view of the email account you entered. As you can see, the email that I send from “my” any-temporary-email account is here in the inbox of “their” friends-temp-email account. When my “friend” accesses this account (following the exact same procedure), they will see it here as long as they check within 8 days of the email being sent. This is because all messages in YOPMail are automatically deleted after 8 days. Likewise, when my “friend” reads my email in YOP, they will be able to reply back to me just like in any other email program. All they have to do is have the message open or selected, and click on the “Reply” tab. So, as you can see, it isn’t hard to send emails from a temporary email address using YOPMail. The only catch is that there are some restrictions on what you can do with it. But, if you want an anonymous way to have an email conversation with someone (i.e. not spamming or harassment), then this is a good option. This was just a basic introduction to emailing using YOPMail. In our next tutorial, I’ll talk about how to use some of the more advanced features, like the email alias you might have seen at the top of the inbox. 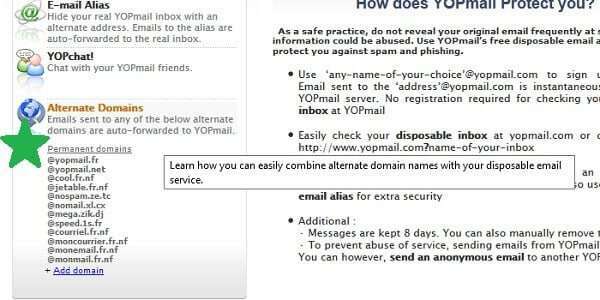 This is a bit of a misnomer, but many people are probably wondering how to create a YOPMail account. The short answer is: you can’t. There is no such thing. 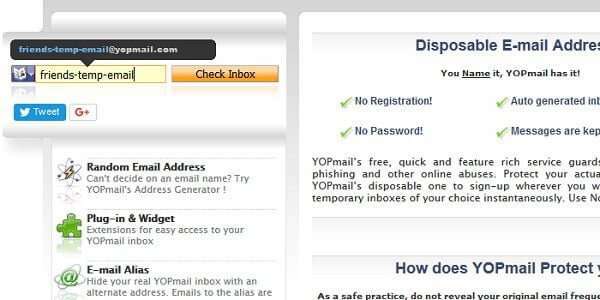 All of YOPMail’s features are available to everyone without the need to create any sort of account. 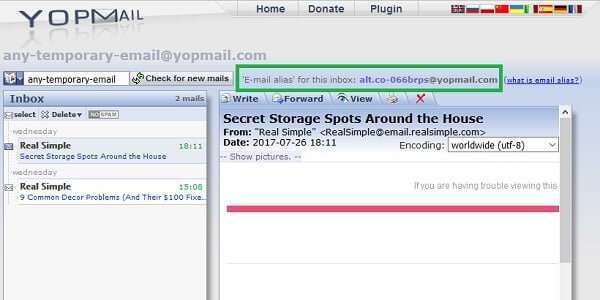 So, this tutorial will help you get acquainted with how to access YOPMail and get around the site – no account needed. Because YOPMail email addresses are designed to be temporary, throwaway email accounts, they aren’t password protected. You can’t “create” a YOPMail email account because all of the accounts have already been created, and are available for public use. It’s clearly stated right here on the home page: No Registration! No Password! That’s why, if you read our introduction to what YOPMail is, you saw how we were able to invent any email address we wanted on the fly and use it to sign up for an email newsletter with no prior registration on YOPMail. In that introduction, I made up the email “any-temporary-email”, and just added “@yopmail.com” to make sure it would go to YOPMail. In this tutorial, I’m going to go ahead and use that same disposable email address. Since it’s been less than 8 days since I first used it to sign up for a newsletter, the newsletter should still be in the inbox. And because of the nature of the YOPMail service, unlike with other email platforms, you can replicate my steps exactly using the same temporary email address (although I wouldn’t recommend using it for anything too personal). In this tutorial, I’m going to assume you have already read through our introduction to YOPMail. In that post, we went over how to use a disposable email address on any website that you don’t want to give your real email to. Now, days later, I’m back on the YOPMail website, and curious to see if I’ve received any new newsletters. All I will do is type in the same email address I used before, and click on the “Check Inbox” button. Because none of the @yopmail.com email addresses are password protected, that’s all you need to access the inbox for this account. As you can see, the first email I got from that newsletter is still here, and I’ve also received a new email. Now, aside from the fact that this email account is essentially public and not password-protected, it functions the same as most other email platforms. 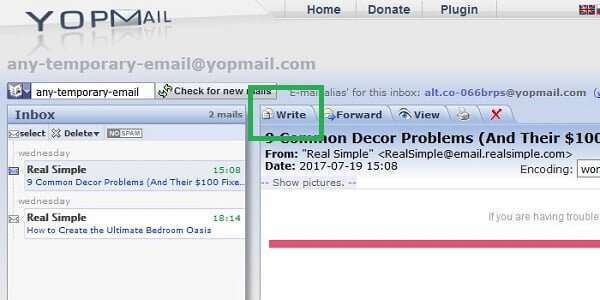 If you look here at the menu bar in the YOPMail inbox, you have options to compose a new email, forward a message you’ve received, print, delete emails, etc. 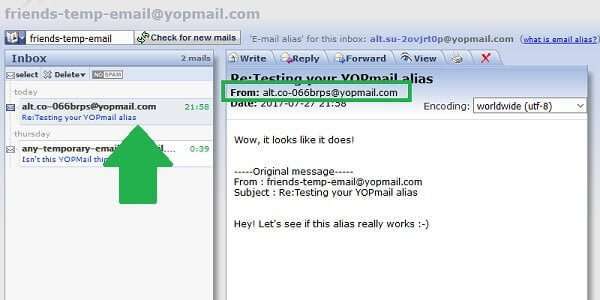 In future posts, we’ll go into more detail about how to use other special features of YOPMail, such as the process of sending emails from a temporary email, using an alias account, and how to use the YOPMail browser plugin. 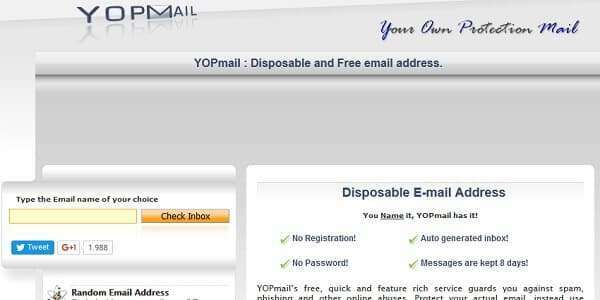 What is YOPMail and What Is It For? With the amount of time we spend on the internet these days, there are countless places where we need to enter our email addresses. Sometimes, we are asked for our email address just to use a website that we are only going to use once. And if we do give it to them, we often find ourselves receiving lots of unwanted spam email. In these situations, a temporary email or disposable email address is very useful. If this ever happens to you, your solution is YOPMail. 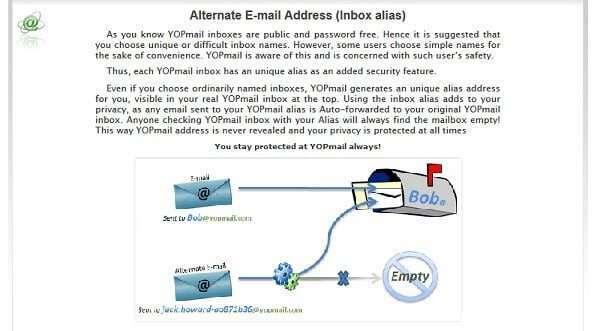 The “YOP” in YOPMail stands for “Your Own Protection”, and that’s exactly what it is for. As you can see in this screen shot of the home page, YOPMail provides disposable email addresses that you can use whenever you need to enter an email address into a registration form but don’t want to be dealing with unwanted emails for the rest of eternity. 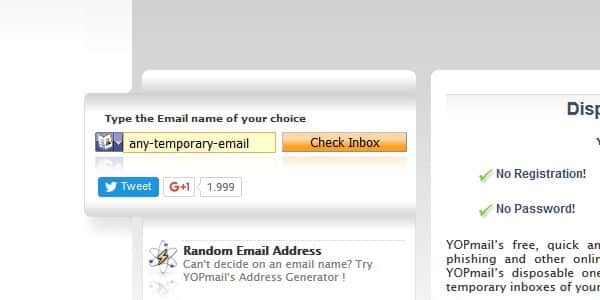 Here’s the basic idea: you simply type in any random email address you can think of into the form you’re filling out on a website, and end the email with “@yopmail.com”. The website will take this temporary email address that you’ve just invented, so you don’t have to give your real one away. 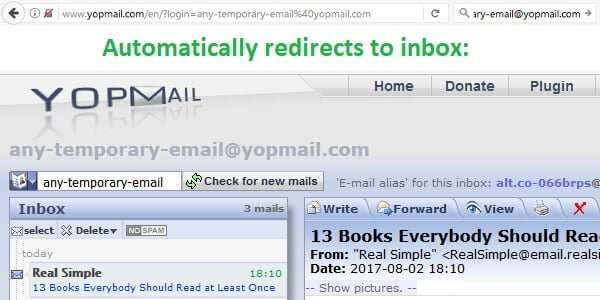 Then, if you need to check an email sent by that website, like an account activation or free download, for example, just go to YOPMail and type in that same random email in the box in the upper left hand corner. 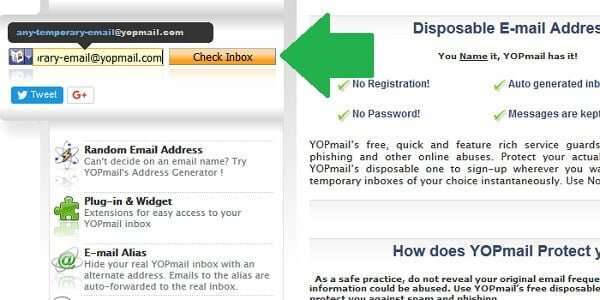 No registration is needed to use a temporary email or throwaway email from YOPMail. The process is quite different from what most people are used to, though, so in this post we have a simple step by step tutorial on using YOPMail’s most basic feature: creating a disposable email, using it to sign up on some website, and checking your temporary email account. First, remember that you don’t need to register on YOPMail to use a throwaway email address there. Just go to whatever website you want. For example, here’s a website I was on that offered a free PDF download of their Detox Guide when you subscribed to their newsletter. 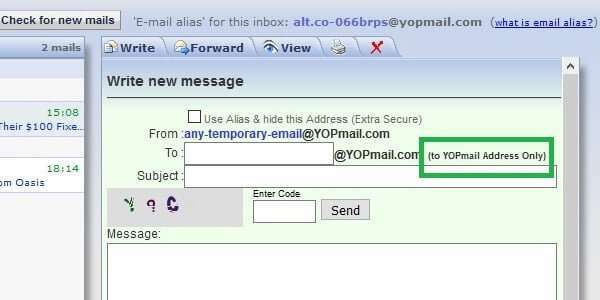 All you have to do is enter an email address here that ends in “@yopmail.com”. It can be literally anything you want, but it’s probably best not to make it too complicated because you’re going to have to enter it later on the YOPMail site. 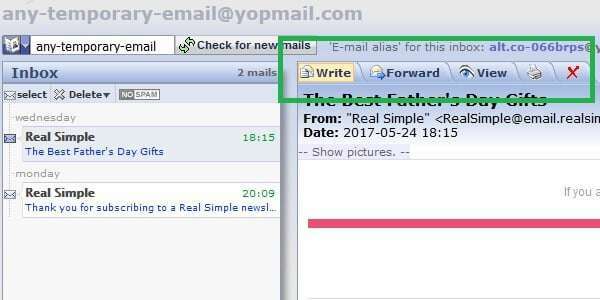 In the top left corner, there is a box labeled “Type the Email name of your choice”. Enter or copy+paste the same email address into that box, and click the “Check Inbox” button. This will take you to the inbox for that disposable email address that you never even had to register for. Note that this means the account isn’t password protected, so we wouldn’t recommend handling and sensitive information in this way. If you are waiting on an email to arrive with a free download link, activation link, etc., this is where you will find it. It could take several minutes to arrive, but it will come eventually. Unless you delete them yourself, any messages sent to this throwaway email account will be automatically deleted after 8 days. So, as you can see, using a temporary email address on YOPMail is quite different from signing up for a regular email account. Basically, because there is no sign up needed!